Ludovic Chavarot, born 1969 in Clermont-Ferrand, is a producer and author for France Culture and Illustrator. Under the pseudonym Lud- Chat he created posters for the British group Tindersticks or the French singer Cascadeur and visuals for the fashion designer Agnès b. He is a member of the Clermont-Ferrand International Short Film Festival and founder of the local LABO competition. Since 2012 Chavarot has been working for France Culture and Radio France on documentaries, creations and sound films. His best known works include ONCE UPON A TIME JOHN C. HOLMES, CASQUE D‘ENCRE, PORTRAIT OF LOUISE BROOKS, LES MAINS D‘ORLAC OU QUAND LA CHAIR PREND ÂME, and LES PROIES. His latest sound film (LE BRASIER SHELLEY starring Marianne Faithfull and Gaspard Ulliel) was selected for the Festival du Nouveau Cinéma de Montréal 2018. Chavarot is also curator of the print exhibition Anatomy of the Lab, which takes place every year during the Clermont-Ferrand Short Film Festival and will also be presented in excerpts this year during the Regensburg Short Film Week. Nicolas Khabbaz was born in Lebanon and grew up in a family where art is a daily practice. Nicolas Khabbaz graduated in film, he studied the cinema of small nations and the question of his identity in „Lebanese film and cultural identity“. In the meantime, he has become the artistic director of the NDU International Film Festival and the Batroun Mediterranean Film Festival, of which he is also the founder. Since 2012, he has been Director of the Audiovisual Art Department at Notre Dame University – Lebanon (NDU). Between 2005 and 2019 he produced 14 plays, written and directed by Georges Khabbaz, with whom he co-founded Khabbaz Production. Khabbaz has participated in several international festivals around the world as a filmmaker, jury member and guest lecturer. He produced and wrote his first feature film WAYNON (VOID) in 2013 and produced several award-winning short films. His film ON THE ROPES (2016, director: Manon Nammour), premiered in the official competition in Locarno and was part of the international competition of the Regensburg Short Film Week 2018 where Khabbaz also presented his favorite Lebanese shorts at Cinema Mi Amor. BARAKAT (2019, also directed by Manon Nammour) is his newest production. Takashi Makino, born 1978 in Tokyo, completed the Cinematography / Sound Recording course at the Department of Cinema at Nihon University College of Art, Japan in 2001 and studied film, light and music under the Quay Brothers at Atelier Koninck in London in 2001. Makino is currently based in Japan and presents films, music, installations and audiovisual performances around the world. Makino was awarded the Tiger Award at the Rotterdam International Film Festival in 2012 and has received various awards at several international film festivals. His film works have been shown in over 120 cities around the world, e.g. at documenta 14, Athens (2017); Austrian Film Museum, Vienna (2017); New York Film Festival (2014, 2017); Whitechapel Gallery, London (2016); The Korean Film Archive, Seoul (2016); BFI IMAX Theatre, London (2016); MoMAPS1, New York (2013); San Francisco MoMA (2009); New Museum of Contemporary Art, New York (2008). Paul Brunnbauer is studying movement sciences at the University of Regensburg. He discovered his love for film and photography at the age of 14 when he took numerous holiday photos and videos. To this day, he has constantly expanded his skills by taking pictures of friends in his spare time and travelling with them to exciting locations where he does shootings. In 2017/2018, he participated in the project Heimat Homegrown, in which regional bands were given a stage. In this project, he was responsible for filming the performance. These videos can be found on the YouTube-channel of the Bar Heimat. Korbinian Prasch has always been a “creative person” and as a visual person found the medium film in all its facets to be completely engaging. He loves to spend a whole night watching Stanley Kubrick, Hitchcock and David Lynch, but also likes a real classic like Sharknado or Kung Fury. However, it was only at FOS with the design branch that he learned to understand films from an analytical point of view. A field of knowledge that he now deepens even further in his current design studies in Münster. His first own short film called FLUCHTPUNKT was shown at the Bavarian Film Festival. Laura Guppenberger is currently studying English and Cultural Studies at the University of Regensburg. Prior to this, she spent three years at the Kunst FOS in Straubing and has already made a film together with Korbinian Prasch as part of a school project. Based on this practical experience at the Gestaltungs-FOS in Straubing, she discovered her enthusiasm for film. Especially films with surreal and poetic forms of expression and different meta levels are for her favorites. Jani Sellmann is head of the online department at the school newspaper Blickkontakt. Here he has gained experience in the field of photography and film and is now shooting small aftermovies for events. He is an allrounder, runs his own YouTube channel Film Paradise is a technician at the theatre of the Von-Müller-Gymnasium Regensburg and has a great passion for public relations. Daniel Schiller attends the Goethe-Gymnasium in Regensburg. He is an enthusiastic film fan and through the film group at his school, he already had the pleasure to be part of the short film week with the film STUFEN. His film group was represented with the film DAS ANDERE SEHEN at the DOK. fest in Munich last year. Monica Koshka is the Artistic Director of the KUKI Short Film Festival for Children and Youth in Berlin: Mum, feminist, pop-culture partisan, freelance translator and first-generation goth from Melbourne, Australia. She has worked as a programmer, presenter and pastry cook at interfilm Berlin since 1998. Monica celebrates the radical, emotional and creative potential of the cinematic short form. Patrick Holzapfel works as an author, filmmaker, and freelance cura- tor. In 2016 he received the Siegfried Kracauer Scholarship from the Association of German Film Critics. He is founder and editor-in-chief of the blog Jugend ohne Film. His texts also appear regularly in Filmdienst, Perlentaucher and Mubi Notebook. His works follow ontological lines of thought and fathom their limits with a focus on the invisible of the image or silence in writing. He is currently working on a documentary about the island of Krk. Julia Ocker is a director of animated films, a designer, and an author from Stuttgart. She studied visual communication in Pforzheim and Cairo from 2003 to 2005 and animation at the Filmakademie Baden- Württemberg from 2006. Her film KELLERKIND won the First Steps Award 2012 in the short film category. It has been shown at numerous festivals and awarded the „Besonders Wertvoll“ (particularly valuable) distinction by the Filmbewertungsstelle Wiesbaden. Even more successful is the ZEBRA, which she contributed to the second season of the children‘s series ICH KENNE EIN TIER together with the short film KUH. Her series ANIMANIMALS developed from these films. This series runs at Kika. Julia Ocker has already won numerous prizes at various festivals. Toni Lüdi was born in 1945 in Taufkirchen (Vils). The Swiss studied painting in London and Munich, where he was a pupil of K.F. Dahmen at the Akademie der Bildenden Künste. He had his first contacts to film in 1967/68. For three years, he had a creative partnership with the British successful set designer Anthony Powell. The focus of his work can be found in the field of TV design; among other things, he created title and television graphics as well as scenery for TV programs such as Info-Show, Hermann van Veen, Clown&Co and Lindenstraße and works for artists such as Gianna Nannini. For Bayerischer Rundfunk, Südwestfunk and WDR he designed and equipped about 1,300 programs. He was also set designer for 18 feature films, including DER BÄR by Jean-Jacques Annaud, VERSTECKT, DER TOTMACHER and the 13-part family saga DIE ZWEITE HEIMAT by Edgar Reitz. The drafts for Wim Wenders‘ DER AMERIKANISCHE FREUND, which he made together with his wife Heidi Lüdi, meant for him the entrance into the world of cinema. Since then Lüdi worked for selected productions of central German filmmakers. Lüdi was awarded the Bundesfilmpreis for the film adaptation ZAUBERBERG based on the book of the same name by Thomas Mann directed by Hans Geissendörfer. He lives in Bavaria. Peter Riepl was born in Wels, Upper Austria, in 1952. He studied Architecture at the University of Innsbruck. He is self-employed since 1985, for example at Riepl Riepl Architekten in Linz, Riepl Kaufmann Bammer Architektur in Vienna. His temporary activities comprise: Working as a visiting professor at the University of Kassel, the University of Applied Sciences in Munich and the University of Applied Sciences in Darmstadt. Furthermore, he is part of the architectural advisory board of the Bundesimmobiliengesellschaft and part of the architectural committee in Passau, Salzburg and Regensburg. Also, he is a member of the advisory board for Arts and Building at the Austrian Federal Ministry of Education and Arts. Further, he is interested in the development of the Urban environment, which can be seen in the selected projects: Municipal center and Research institute Hagenberg / OK Offenes Kulturhaus Linz / Church St. Franziskus, Steyr / 09 Hafenhalle, Linz – the temporary event venue during the European Capital of Culture in Linz 2009 / Congress Schladming / Nursing Home Liesing, Vienna / Sonnwendviertel, Vienna / Media Center ORF Austrian Broadcasting Cooperation, Vienna / University of Applied Arts, Vienna / JKU Campus Linz. Honors: Cultural Prize of Upper Austria, Austrian Architects Central Association – Client Award, Regional Timber Construction Prize Upper Austria, Regional Timber Construction Prize Vorarlberg, Architecture Prize of the County of Burgenland, Architecture Prize New Alpine Architecture Sexten. Gerhard Matzig was born in Deggendorf in 1963. He studied political science, law and architecture in Passau and Munich, graduated in 1993 as Dipl.-Ing. univ. After a traineeship at the Passauer Neue Presse he joined the editorial staff of the Süddeutsche Zeitung in 1994. Since 2001 he has been editor-in-chief of the SZ and reports on architecture, urban planning and design in the feuilleton. He has been awarded numerous prizes for his reports, reviews and essays. He has published several books. Gerhard Matzig was a lecturer for product design at the University of Applied Sciences in Munich, taught cultural journalism at the German School of Journalism in Munich and as an honorary professor of scientific theory at the University of Applied Arts in Vienna. He is married, has three children and lives in Munich. Tom Kimmig, born 1968 in Baden-Baden, Germany, trained from 1992 to 1994 as a camera assistant at the State Technical School for Optics and Photography in Berlin. He worked as a camera assistant from 1992 to 1997 before beginning his studies at the Berlin Film and Television Academy. In addition to producing his own short films, from 2000, he increasingly worked on documentaries and music clips as a director and camera operator. Since 2005, he has been producing scientific films for the Deutsches Museum in Munich. He also produces audio-visual content for the Goethe-Institut Headquarter, Wiedemann & Berg Film, Collina Film, deutschfilm, Bavaria Pictures, Studio TV Film GmbH. In 2015, he was an academic assistant at the Film University Babelsberg. 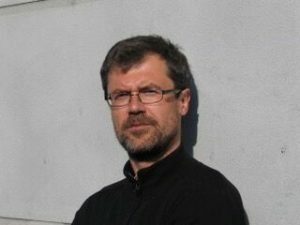 He has been a member of the board of Transmedia Bayern e.V. since 2017. Tobias Krone, born 1985 in the Black Forest, works as a Bavarian cor- respondent and cultural journalist for Deutschlandradio and Baye- rischer Rundfunk. He studied sociology and Romance languages and literature in Hamburg, Paris and Jena and studied at the German School of Journalism in Munich. Since his review of TITANIC he has been reporting on films in the school newspaper. What interests him about film: the unmediated, the inconspicuous and the invisible. What fascinates him about short film: If he keeps running in his head afterwards, in the length of a feature film – if it was a good short film. His anticipation of the Bayernfenster: to discover what Bavaria could still be – out of home. Prof. Dr. Raphaela Henze is professor of Arts and Cultural Management at Heilbronn University and Co-Investigator of the Arts & Humanities Research Council funded, international and interdisciplinary network Brokering Intercultural Exchange (www.managingculture. net). Prior to joining Heilbronn University in 2010, Raphaela Henze worked in several senior management positions in universities, ministries, and foundations. Her main research focus is on the impacts of globalization and internationalization on arts management and arts management education as well as on the role of arts and culture in times of raising populism. Raphaela Henze studied law at Humboldt- University Berlin and Paris X-Nanterre in France, received her Ph.D. from Ruhr University Bochum, was a postdoc in the Law, Media & Culture Project at Yale Law School, USA, as well as at the National Institute for Educational Policy Research (NIER) in Tokyo, Japan. She holds an MBA from the University of London. She also is founder of the kurz. film.fest for young and aspiring filmmakers in Künzelsau (www.kurz- filmfest.info). The second edition of this festival, which is organised by cultural management students, has taken place in January 2019. Born 1981 in Regensburg, Markus Güntner started his music career at the age of 14 and already played in clubs in Regensburg at the age of 15. SPEX once called him a „metropolis refuser“ – which can be affirmed confidently just because of his first release called „regensburg“. Since 2000 he released a considerable number of maxis, albums, remixes etc. on international labels, which brought him worldwide fame and appearances. In 2018 his eleventh album „empire“ was released. 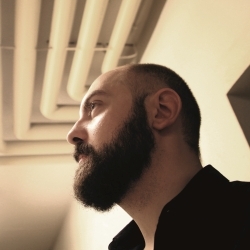 Güntner also produces sound installations for art projects and exhibitions. the spherical and minimalistic ambient/neoclassic sound of the DJ, composer and producer (since 2009 also active graphic designer) is also responsible for some soundtracks, jingles and advertising music, which not only make him an inherent part of the Plattenfilme at the International Short Film Week Regensburg. Kristina Hödl was born in 1979 in Linz / Austria. She studied communication sciences and languages at the Paris-Lodron University in Salzburg and in Salamanca. After several positions in the cultural sector, among others in Linz for „Linz 2009 European Capital of Culture“ and the „Ars Electronica“, for galleries of contemporary art in Vienna and Salzburg as well as for the urban development project „IBA – International Building Exhibition“ in Hamburg, she has been responsible for conception and public relations at the Cultural Office of the City of Regensburg since 2013. Markus Wolf is a software architect and creative technologist from Regensburg. He was born in 1974 in Regensburg and studied Informa- tion Science and Philosophy at the University of Regensburg. Since 2013 he has been working as a freelancer mainly for design agencies in projects with strong technological aspects. He tries to mediate between the two domains of design and technology, partly in a consultative but also in a practical way. Light and sound play an important role in his generative installations. Non-deterministic control systems create repetitive patterns and sound structures that never repeat themselves.